Melondrea is a free browser extension which you should remove from your Internet Explorer and other browsers if you want to browse the Internet safely. The primary aim of the developers of the program is claimed to be the enhancement of your browsing experience; however, soon after installing Melondrea, you may find that it is quite the opposite. The browser add-on Melondrea is capable of displaying advertisements of different types, including web banners, pop-up ads, coupons, in-line advertisements, and some others. All these advertisements are displayed on both commercial and non-commercial websites, which are not affiliated with Melondrea and the websites that are being advertised. 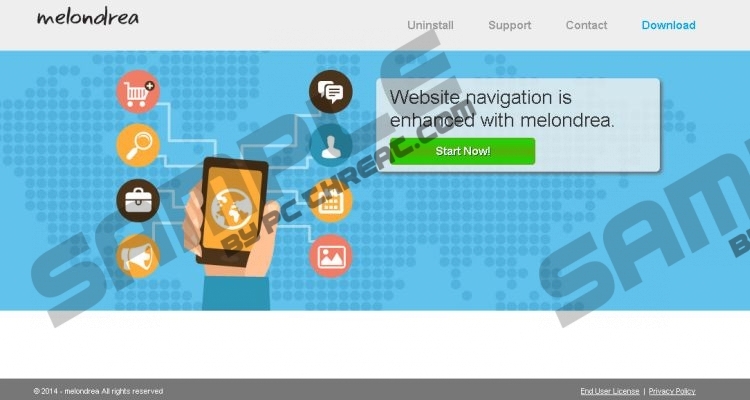 Melondrea is developed by SuperWeb LLC, which is infamous for many identical programs such as LinkiDoo, Web Flipper, GoingGo, Fortunitas, etc. All these programs are sponsored by third-parties and are not endorsed by the creators of the software. Every click on an advertisement displayed by Melondrea is your own responsibility. For example, you are browsing the Amazon.com website and find some advertisements brought to you by Melondrea. When you click on that advertisement, you are taken to a website which has nothing to do with Amazon or the developers of the adware program, which means that you interact with those advertisements at your own risk. There are many wicked webmasters who seek to promote their deceptive web sites in many different ways. Pop-up advertisements are one of the means to generate more traffic. If you do care about your operating system and do not want to be deceived into installing unreliable programs, we recommend that you remove Melondrea from the computer as soon as you can. You may be offered a chance to enter some dubious contest, scan the computer at no charge, etc. Some of the offers may be tempting, but bear in mind that you cannot be sure to what website you will be taken. When you access a website that you do not know, it is worth doing some research on the website. Find out it ratings and read the reviews to make sure that you can trust the website. Our advice is to remove Melondrea from the computer so that you do not have to put up with annoying pop-ups. Although it is possible to remove Melondrea using the Windows Control Panel, our team recommends a spyware removal tool. You can easily get rid of the adware program with the help of SpyHunter, which is a powerful and reliable spyware and malware prevention tool. If for some reason you do not want to implement a reputable security program, use the following removal guide. In case of any question, feel free to leave a comment below in the comment box. If you have already tried to uninstall Melondrea, bear in mind that it is worth scanning the system. Click the button below to download a free scanner. Run a system scan and invest in the program if need be. Quick & tested solution for Melondrea removal.